In this program, students will learn the background, history and steps to various Philippine folk dances. At the end, there will be a culminating cultural performance at a community event. Classes will be taught by experienced instructors. For students ages 4 and older. Students (ages 4-12) will be able to further explore, learn about and connect with the Philippine culture and add to their growing Filipino vocabulary. The goal is to connect their learning experience to understanding who they are today, and how to maintain that connection with the Philippines and to be proud of being Filipino. Various learning and teaching methods will be used to ensure a fun, yet educational, experience. Topics may include: Feelings and Emotions, Indigenous Philippine Handicrafts, All Saints and All Souls Day, Andres Bonifacio, Philippine Foods and Desserts, and more. Guest instructors will join select classes as they share their love, passion and expertise of Philippine culture with the students. This program is open to children in grades PreK-5. This is the perfect class for those planning a trip to the Philippines or wanting to brush up on their Filipino. Open to Filipinos and non-Filipinos alike, learn more about the Philippine national language and culture through this introductory class. The course covers the basic rules of grammar, verbs, and common vocabulary to get you by everyday situations in the Philippines or while in the company of Filipino speakers. Learn to understand and use familiar everyday expressions and basic phrases. Introduce yourself and others. Ask and answer questions about yourself and have simple conversations such as where you live, people you know, and things you possess. Learn to interact with others at a beginner level. There are also discussions on the history, culture, and business practices of Filipinos. Having acquired basic grammatical and syntactical skills in our Level I program, the aim and focus of this course is to practice that knowledge in daily conversation, while further developing the ability to use more complex sentences. This program will concentrate on verbs and the unique way they are used in Filipino. The students will, at the same time, expand their understanding to facilitate reading, speaking, and writing skills. They will familiarize themselves with Filipino as a living tongue by examining the cultural and historical contexts within which it evolved. This course continues where Level II left off. Each one is encouraged to take an active part in class. The willingness to make mistakes, a process that enables one to learn faster and more thoroughly, is vital to the learning process. The classes will further articulate grammar principles and vocabulary building. We will practice that knowledge in daily conversation, while further developing the ability to use more complex sentences using verbs. We will continue to use an interactive approach (role playing, dialogue building, games, etc.) to increase your confidence and ease in conversing in the Filipino language. For immersion, we will spend conversation time (kuwentuhan) with a few members of the Filipino community who are native speakers of the language. 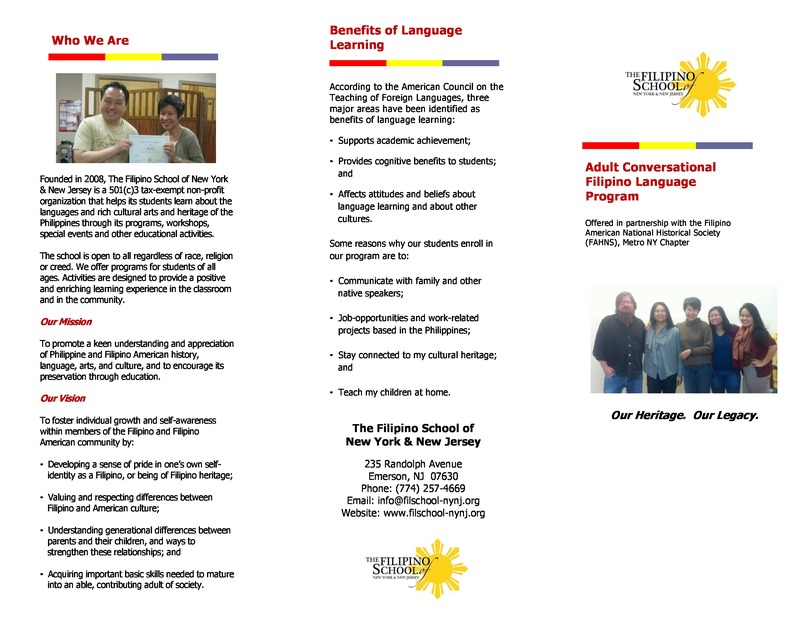 To download our brochure for the Adult Conversational Filipino Program, click thumbnails below.